Hydro hoe cutter blade | Thermal Technology Services Inc. The subject matter is replacing a stock hydro hoe cutting/wear bar on a Kumatzu . 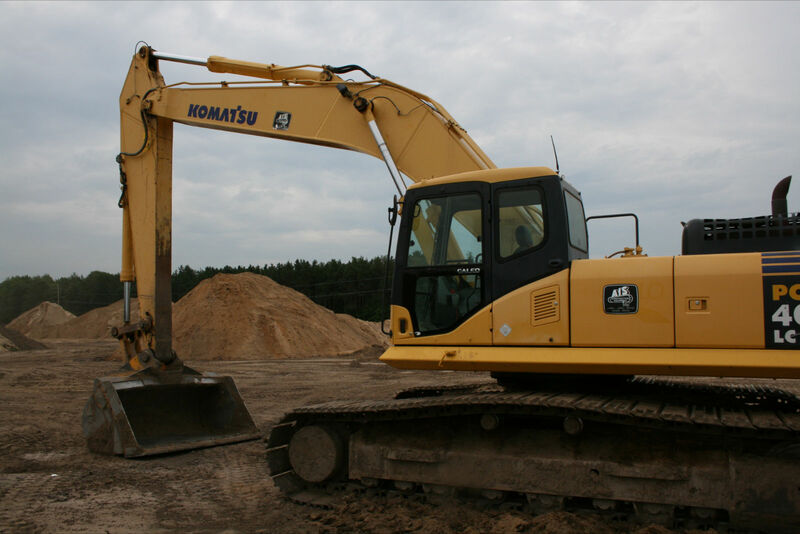 It was done on the unit owned by Kenney Trucking and Excavation at their sandpit. They in the past have utilized stock replacement bars versus aftermarket bars. The results were similar as to wear but the cost of the two varied. Approx. $4000.00 for stock, and $2800.00 for an aftermarket. What was utilized in this case was a stock piece of AR400 cut to the dimensions of the original plate , basically 72” x 16” x 1’¼”. The cost of this piece was approx. $1000.00, than to this was added the cost of drilling the proper holes as means of attachment. This added approx. $250.00 to cost of unit. Then the unit was Thermally Cycled at a cost of $512.00, based on weight of 512lbs @ $1.00 per lb. According to Mike Kenney the blade will typically last a digging season at the pit on one side. 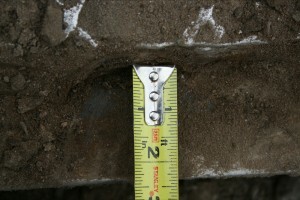 This would appear as exposed edge beyond bucket edge, with this measurement being 2 ½ “. On the modified unit they are at half way through their sand season and at this point in time they have mined in excess of 59620 yards of sand. The unit was measured at this point to verify wear to date. At this point the original and after market blades would be at approx. 1 ¼ inches of wear. At this point in time the AR400 Thermally Cycled blade is at 1/16” of wear. So if this pattern continues here is the math as I see it. Stock /aftermarket is wearing at the rate of 1/16” per 1800 yards of sand , or to wear blade to place of total replacement it should bucket approx. 238480 yards of sand. The rate of wear that exists on the AR400 Thermally Cycled blade is showing it should move 1,907,840 yards of sand unless wear accelerates at a mass volume and yet to be seen. At the above rates the stock blade has a cost of .0168cents / yard of sand. 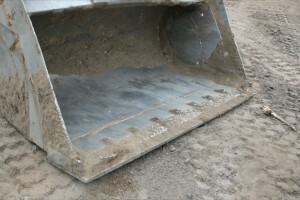 At the above rates the aftermarket has a cost of ..0118 cents / yard of sand. At the above rates the AR400 Thermal has a cost of ..0001cents / yard of sand and should save extra monies in the form of labors to replace blades , and costs of down time. To explain in better more visual terms, with a 4 ½ yard bucket it is running approx. .0756 cents per scoop.with a stock wear blade. Then a aftermarket would run approx..0531 cents per bucket. The AR400 Thermal would cost approx. .0005cents per scoop..Beyound the first two years, the average life of the stock bar ,they will save $2000.00 per year plus the time to replace the bar. On an aftermarket the savings would drop to $1400.00 dollars and time. One should also take into account the initial $1000.00 in initial cost savings between a stock/aftermarket vs. the Thermally Cycled AR400. Real cost savings. At this existing rate the AR400 Thermally Cycled blade should outlast the life of the machine.